THE US elections are still a few months away, but conservationists in the country have already cast their vote. The League of Conservation Voters, a non-political lobbying organisation, has ranked the Democrats environmental record over President George Bush's. While the Democrat presidential nominee Bill Clinton's main advantage is his vice-presidental partner Al Gore, an ardent environmentalist, Bush loses points for "being the single biggest obstacle" to the international convention to check global warming. But in the year of recession and rising unemployment, environment may not be the right green card. The Republicans certainly don't think so. Vice-president Dan Quayle is using every bit of anti-ecological paranoia to gain points over his rival. Passing through Michigan on the election trail, Quayle called Gore's environmental views as "hysterical" and said the Democrats could cost hundreds of thousands of autoworkers their jobs by pushing for higher fuel efficiency standards. 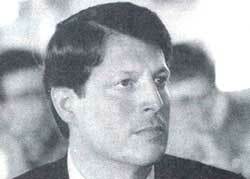 Gore immediately replied saying the Republicans pose a "false choice between jobs and the environment". Germany and Japan, he said, are openly admitting that the biggest market in the history of world business is the market for the new products that foster progress without environmental destruction. The fight is heating up. On the one hand, scoring on foreign policy, Clinton has accused Bush for "abdicating leadership" on global environmental issues at the Earth Summit. The Republicans are scoring on the homeground by wooing the landowners in the rural west who view environmentalists as dangerous fanatics. Quayle, addressing a group of ranchers, said the Clinton administration, if voted to power, would strengthen the protection for endangered species. "They (the Democrats) talk about putting people first. They put people first only if you happen to be a spotted owl or a giant garter snake," he continued. To show on which side his administration stands, Bush is already pushing new policies to make it more difficult for environmental groups to stop timber sales, mining or oil drilling operations. His measures will please the "wise movement", a coalition of industry and rural families in Nevada and Montana, fighting conservationist supported curbs on grazing, mining, oil exploration and hunting.